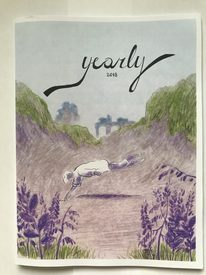 Yearly 2018 is the debut issue of Andrew White's projected ongoing series of comics annuals. Weighing in at 72, full color, magazine-size (8 1/2" x 11") pages, it offers a substantial chunk of comics that will lead the reader through an engaging exploration of a significant amount of comics terrain. The cover image, of a figure hovering, dreamlike, just above the ground amid a dune-like clearing with ruins silhouetted in the background, reaching down to the ground and touching it with a finger tip, suggests itself as a symbolic representation of White's approach to the comics that follow. The grid is in (nearly) full-effect here, with stories laid out in regular rhythms ranging from two to twenty panels per page. 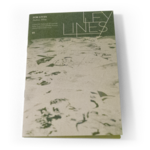 The issue contains five major pieces along with a sizable assortment of minor, short pieces. The centerpiece is the tripartate "Ghosts," which takes up about half the issue. This rumination on the presence of absence brought about by death as well as by the loss of abilities is the central statement of White's thesis as he weaves together a number of techniques while modulating their interactions: a light black-line over strong color fields, the latter registering emotional temperature, which pivots back and forth along the scale by varying levels of yellow or blue being combined an omnipresent red, while, taken together, the interplay between line and color serves additionally to express the sense of spatial clarity experienced by the characters, which in turn serves to express the presence of absence; all this is overlaid by the grid, which shifts from 20-panel to 16-panel before dramatically shifting to 2-panel at the same time eliminating the black line. In "Earth," the absent presence of telephone conversations is revealed through an ingenious graphic device, along with the ramifications of not being fully "there." "Larsen C" attempts to open up a new mental space for imagining global warming by manipulating its temporal and spatial coordinates. An excerpt from James Baldwin's novel, Go Tell It on the Mountain is provided with an intriguing visual adaptation. Employing an eight panel grid throughout, with an almost complete lack of text, White has chosen to tackle visualizing a "vision." The representation of the external physical reality in which the vision transpires is set apart from the vision itself by the panels having lined borders, while those depticting the vision itself, are, fittingly, open. On the narrative side, both the opening tale, "Ten Thoughts," and the closing 20-panel back cover piece, "Compiled," have a notably Borgesian air about them, perhaps indicating a future direction for the series. On the visual side, while White's art has a host of precursors, incorporating numerous influences, as in much of his previous work, certain of Cezanne's techniques show through here. 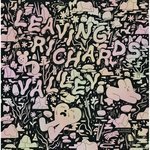 Techniques and ideas employed by Frank Santoro, Dash Shaw and Warren Craghead are also in evidence, making for an interesting mix. Here's to Yearly being indeed yearly for years to come!